If you’re looking to add a little adventure to your life, Meetup may be the app for you. 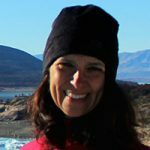 The Meetup app led Jane Vangelov to two great adventures last year. Neither are activities she would have pursued on her own. But experiencing them with a Meetup group opened her up to a bold new activity that she never would have tried otherwise. 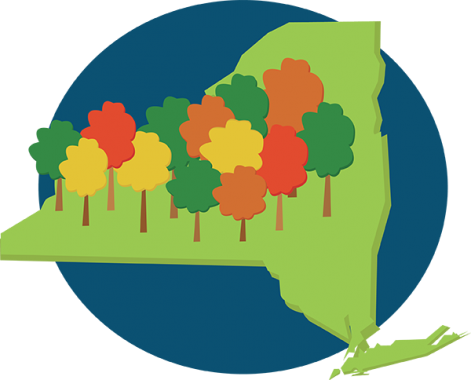 It was through the Syracuse Area Outdoor Adventures Club Meetup group that Jane participated in two hikes in 2018. The first was a 6-mile hike in April of the hilly area behind the office of Green Lakes State Park. Her second foray was a 10.4-miles hike in Highland Forest in May. 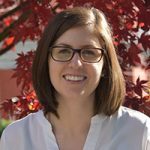 Being a novice, Jane undertook her first hike with the Meetup group clad in a pair of ordinary sneakers, jeans and a light jacket one weekday after work. When she arrived at the designated gathering area, she found nine people had assembled. She started out strong, but quickly joined the few picking up the rear as other, more experienced hikers moved to the front of the group. “I felt spent afterward,” she admitted, “but I still went to work the next day.” She also signed up for another, longer and more challenging hike a month later. The second time, she came prepared. She had newly purchased hiking boots, along with a packed lunch, long-sleeved shirt, bug spray and other necessities for a day out on the trails. But even with the new footwear, Jane confessed that she was ready to quit five miles in. 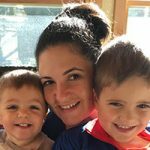 “There was no mistake that my body was telling me that I was doing things I’d never done before,” she said. A conviction that she could complete the hike kept her going. This knowledge, paired with encouragement from the group, propelled her ahead in spite of the tough conditions. The Syracuse Area Outdoor Adventures Club Meetup group isn’t the only Meetup with which Jane’s involved. Her favorite one is the Syracuse Adult Beach Volleyball Meetup group, which usually gathers on Sundays during the summer months to play at Pine Grove Health & Country Club in Camillus or the North Area Family YMCA in Liverpool. On one Sunday in July, 18 people showed up to play beach volleyball, said Jane. “Some weeks, we have more players, while other weeks, we have fewer,” she said. When there are fewer players, they play three-on-three or four-on-four, with several games usually going on at once. Jane also has tried Meetup groups for meditation and dance. She quickly realized that the meditation group wasn’t for her and dropped out. Jane also belongs to the Dance Meetup group, which she said hasn’t been as active in recent years as it once was. 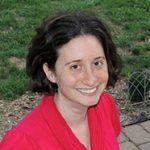 Each Meetup group is highly dependent on an organizer, notes Jane. “Someone has to take the initiative to get a group going and keep it going by organizing events,” she said. The organizer generally organizes and posts events to Meetup, where group participants can get information regarding upcoming events. Ryan Kelly is organizer of the Syracuse Hanging With New Friends and Hanging With New Friends of Rochester Meetup groups. He took on both roles when the previous organizers stepped down. 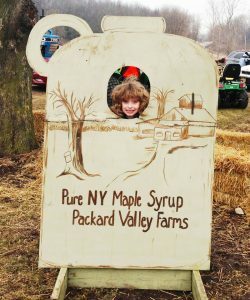 The bimonthly events he organizes have ranged from singing at Singers Karaoke Club in Syracuse to apple picking and visiting the MOST and the Rosamond Gifford Zoo. He also arranges weekly Trivia Night events at such locations as the Yellow Brick Road Casino, Movie Tavern and the American Legion in Manlius. 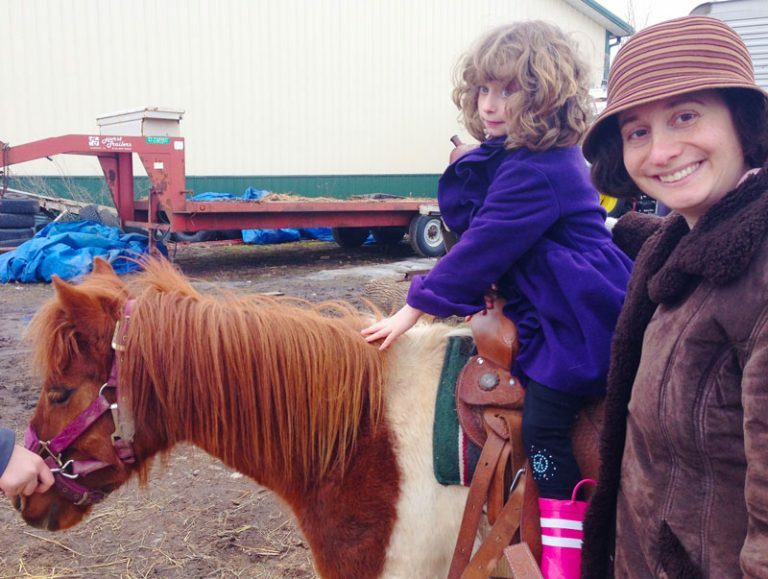 With activities scheduled for every weekend, the Rochester group is very active. Activities have included visiting a haunted house last fall, attending a comedy show, having a picnic, going rock climbing and playing laser tag. “It’s not for everybody,” Ryan admitted. “But I’ve met some of my best friends through Meetup.” For him, scheduling and attending activities helps him break out of his shell and assume a leadership role of an organization. He finds that people who are a bit on the quiet side, as he sometimes is, are eager to use Meetup to break their own barriers. “What you put into Meetup is what you get out of it,” he said. After years of going to events by himself, Ryan now much prefers going out and doing things with others as part of a group. When you download the Meetup app, you first provide some basic information about yourself and your interests. Then you’ll receive notifications regarding upcoming events. You can elect to join – or not join – events, based on your interests and availability. “There’s a lot of flexibility,” said Jane. 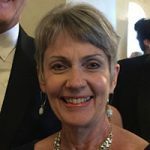 “You don’t necessarily have to be friends with the people in the group that ends up going.” The people who get together for an event inevitably do get to know each other during the event, leading to new friendships and an ever-broadening array of connections. It offers the chance to do something you’re totally comfortable doing. At the same time, Meetup also provides opportunities for doing something you normally wouldn’t try on your own, but in the safety of a group. “There’s something for everyone,” said Jane, noting that it can fill your recreational, social and spiritual needs. Meetup is also nationwide. So if you’re visiting New York City, for example, and find yourself with a free afternoon, a quick check of the Meetup app will provide a variety of options to choose from for any events that conform to your chosen interests happening in the New York City area. Binghamton, Elmira, Buffalo, Rochester and Utica all have Meetup groups of their own. There are Meetup groups for single people, married couples, those who are older and those who are younger. In Syracuse, they include ethnic dining groups, foreign language groups and professional networking groups. New Meetup groups are always being started, Jane said. Jane cautioned that there are some unwritten rules for Meetup participants. “You have to show up on time for an event,” she said. Arriving consistently late for events, being inconsiderate of others in the group, turning up unprepared for the event and failing to cancel a reservation to attend can all result in you being kicked out of the group. Ryan echoed Jane’s sentiments. “There are Meetup groups for just about every interest,” he said, “and if there’s not one already available, you can create one of your own.” He recommends trying it at least once to see how you like it. 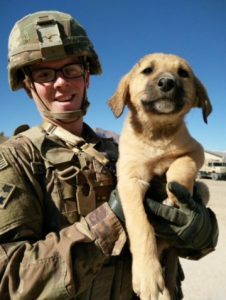 When my daughter showed me a picture of a little pup found under a storage container in Afghanistan last fall, I was hooked. This puppy was beyond cute. It was a little ball of blond fur with these sad, brown eyes. Luna was one of nine puppies born among the dirt and rocks of a military base in Afghanistan. My daughter’s fiancé, Jake, and his Army unit stationed there believe it was the mother’s third litter, and that only one pup had survived from her previous litters. According to Jake, the puppies in this litter were docile, sweet and loving. Luna was the one little pup that boldly approached him and nuzzled in under his feet. It wasn’t long before Jake and my daughter, Mary, agreed to adopt her. The contractors who worked with Jake on the Army base were equally taken with the litter. Thinking that the pups had little or no chance of surviving, they summoned all of their patience in coaxing and rounding up the pups and their mother for a trip to Nowzad Animal Rescue Hospital in the Afghan capital of Kabul. Meanwhile, back in the states, the wife of a contractor connected with “This Is The Dog,” a nonprofit animal rescue in Miami. It took some planning, a great deal of collaboration and incredible generosity on the part of people involved with this wonderful organization for the first steps in what seemed like a nearly impossible rescue operation to take shape. Mary and I started making plans of our own for a trip to Florida to retrieve little Luna. Because she would arrive just before Christmas, flights and rental cars proved too costly, so we decided to take a road trip and drive to Miami instead. While these details were being worked out, the puppies received their first round of vaccinations. Everything seemed to be falling into place, and things were going well, when we received some devastating news. 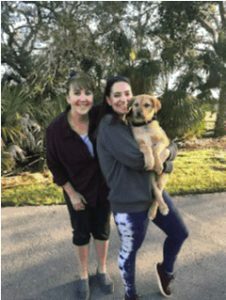 Luna, the little pup that bonded with Jake, had contracted parvovirus, a dangerous and deadly virus that is extremely contagious. Luna was the first puppy to die, and all of her siblings became very sick. We were crushed; we thought they’d be safe at the animal hospital. Nowzad bravely treated all of them for parvo, but four more puppies died, and the remaining four were gravely ill. We were all heartbroken, but Jake was devastated. “Unless a miracle happens, they most likely will all die,” Jake dejectedly told us via Facetime. He seemed to have lost all hope and faith. Not really knowing what to say, I reassured him that everything would be all right, even though I knew he was probably right. Mary and I cancelled our plans to drive to Miami. It was just about a week before Christmas, when I received a text from Mary. The four remaining puppies were getting better. The plans were back on to bring them home, and would I still be willing to drive to Miami so we could rescue Noah, one of the four remaining puppies. The pups were granted visas and passports from the Islamic Republic of Afghanistan. 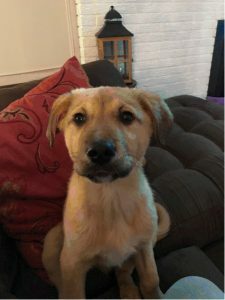 Determined to be healthy for travel by the Nowzad veterinarian, the pups left their early life in Afghanistan behind on December 17, 2018, and arrived safely at the Miami airport late on the night of December 19, 2018. Four This Is The Dog volunteers were at the airport to greet them. One positive outcome from this sad situation was that there was room for the mother dog (since named Rosabella) to make the journey with her puppies. All five were placed in foster homes until their owners were able to get them. Just like that, Mary and I left our home in Syracuse, N.Y., on Thursday, December 20, 2018, and arrived in Miami late Friday night. While we had excitedly had made plans to meet with Noah’s foster mother on Saturday morning, we were a little apprehensive that day, not really knowing what he would be like. All of our anxiety vanished soon after we glimpsed Noah and his brother in front of the house when we pulled in the driveway. He was very scared at first, but allowed Mary to pick him up and hold him. We settled him into our car, equipped with a cage, food, water, blankets and toys, for the trip home. Noah cried a little in the car, but then lied down and really seemed to rest peacefully. He had been through so much already in his short little life. During the long, 24-hour ride home, he mostly slept and came out of the cage for a treat or water every once in a while. We returned home on Sunday December 23, 2018. Since then, Noah has been adapting to his new life very well. Eager to investigate his surroundings, he tried to chew on everything at first. Now, he loves to play and run along the fence with the neighbor’s dog. He’s also very affectionate and really loves to snuggle. He has some trouble listening (maybe he doesn’t know English yet LOL). We plan to enroll him for training in the Clear Path for Veterans Canine Program. I am honored and humbled to have been involved in this puppy rescue operation. It was an unforgettable Christmas. Noah is home. The three remaining pups have been adopted. A family from Key West adopted Ezekiel “Zeke,” and one of the contractors and his wife from Alabama adopted two puppies, Whidbey and Baker. Rosabella is currently being fostered and thriving in her new home. It’s almost spring! For me, that means it’s almost time to celebrate Holi, the Hindu celebration marked by a festival of colors. Different parts of India have different traditions to celebrate Holi, a festival that falls this year on March 20. Holi marks the arrival of spring and the victory of good over evil. I’m originally from the state of Maharashtra in the western part of India. Growing up in this region of India, Holi was a two-day celebration. My mom would start the first day by making a big feast. The highlight of the meal was always the dessert “Puran Poli,” a sweet flatbread filled with lentils, sugar, cardamom, and nutmeg. The dessert is topped with “ghee,” also known as clarified butter. Later that evening, we’d have a neighborhood bonfire. The big “festival of colors” happened on the second day of Holi. To celebrate the coming of spring – we’d throw colored powders at each other while the kids would spray each other with water guns filled with colored water. The author with her family as they celebrate Holi. 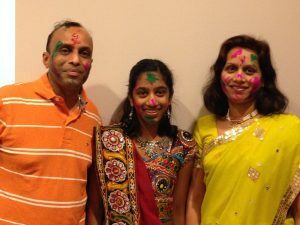 Celebrating Holi in Upstate N.Y.
Now I live in Clarence, N.Y., and haven’t lived in India for almost two decades. I still make my favorite Puran Poli dessert. I’ve included the recipe below. My family and I attend the temple at the Hindu Cultural Society in Getzville, N.Y., where we celebrate the festival with our local community by throwing colors. Everyone from kids to adults enjoy this fun event. We wear traditional clothing during the festival. Despite what you might see in the Bollywood movies, we’re not wearing white clothes during the festival. The one thing I miss about celebrating Holi in India is just how big the festival could become. Everyone celebrated Holi where I’m from. Here, we celebrate at the temple with only 100 to 200 people. It’s still fun and meaningful, but definitely not as big! Wash the chana dal 2-3 times. Add 5 cups of water along with the dal in a heavy-bottomed pot. Let the lentils cook on medium-low heat for an hour, stirring a few times. Remove any white foam that may rise up. Drain all the water. Add sugar, nutmeg powder, cardamom powder, and saffron. 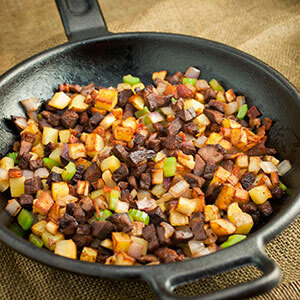 Mix well, and cook stirring frequently for 10-15 minutes on medium heat. Cool down the cooked dal for 10 mins. 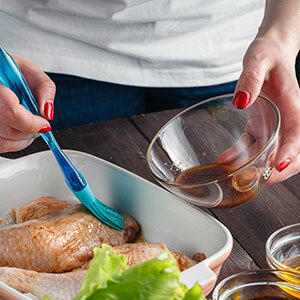 Blend it to a smooth consistency with a hand blender or food processor. Knead soft, pliable dough with 1 cup of whole wheat flour, salt, and oil. Let the dough rest for 30 mins. Start making balls for the dough and the stuffing, which should be of the same size. Put a heavy griddle on medium-high heat. Roll the dough by using the dry wheat flour that is kept aside for rolling. Make a 3-4 inch diameter circle. Put the stuffing in the middle of the rolled dough and then gather all the sides of the dough on top of the stuffing to enclose it. Roll the bread softly using more dry flour. Gently put the rolled bread on the heated griddle. Cook evenly on both sides to a perfect golden brown color. Serve with ghee on top. Given that current weather forecasts for our part of the Northeast are including numbers below the magical 32 degrees Fahrenheit, my mental homeowner ‘to do’ list includes clearing the leaves, starting the snowblower, and so on…standard stuff you may say. You may then quip “Are you nuts? Sounds like a lot of work!” And I’ll agree, but smile, fueled by a fond, selective memory. Starting the two-day water filling process, with 4” – 6” depth the goal for ease of freezing and maintenance. Only one of my boys actively played hockey. Yet both were good skaters and outdoor adventurers who had fun with friends at our house all the time. We had spare skates and sticks of all sizes. Plus two goals and a shooting net behind one to enable retrieval of pucks without too many losses to the neighbor’s deck for springtime discovery. Since hockey families pass along items to newbies as their kids age out, we were lucky too. One parent gave us about 50 extra pucks. Another lent me his “NiceIce Resurfacer.” It’s a water pipe and cloth that evenly spreads the water. This tool saved hours of frustration and would have been worth buying for one season alone! 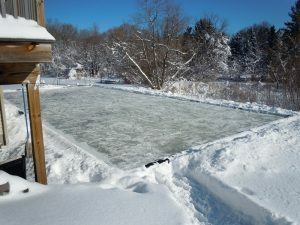 Building and maintaining the 25’x55’ rink was a shared task and one with new lessons each year. 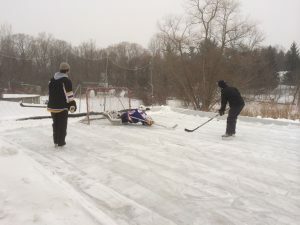 Here are some of those lessons, just in case you decide to start your own “backyard rink” traditions this year. 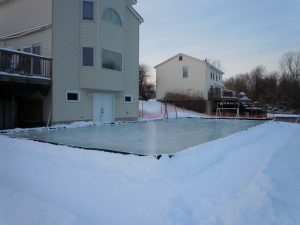 Google “how to build a backyard hockey rink” and watch some of the videos. There are many, many theories, but you’ll get the idea and answers to questions you hadn’t even thought of. 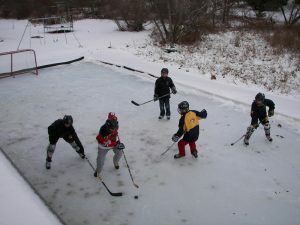 Consider an online vendor such as NiceRink.com for supplies, brackets and such. There are so many other options, you can start simple when the kids are young and improve year to year. Try a marine grade or waterproof tarp instead of stapling sheet plastic. You can reuse the tarp for many years. 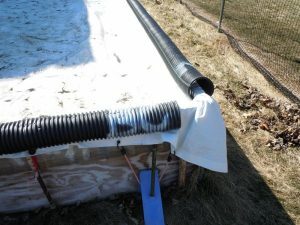 Try placing corrugated plastic drain pipe over the board edges to hold the tarp and protect it from skaters, pucks and shovels too. Leaves from nearby trees have to be cleared promptly, or they will freeze into the surface and melt at a different speed than nearby ice due to color and sunlight. They create pits/holes in the surface of the ice. Once the ice formed for the winter, clearing ANY snowfall was crucial within hours. If not, snow would melt then refreeze and/or worse create slush on the ice surface and the upper snow would create a blanket effect. I was in the habit of clearing the driveway and the rink all before sunrise. Again, a “North Coast thing” perhaps? If your yard isn’t 100% level, that’s OK, the boards can be deeper in some spots. You can also bring in loads of dirt to improve your yard. Sixteen loads helped us! Having a nearby source of BOTH hot and cold water is crucial to success. Sometimes hot water melted and easily leveled the top surface after skating or snow fell. A walk-out basement with available laundry tub served our needs. It also gave easy access to get back in the house when too cold to skate. 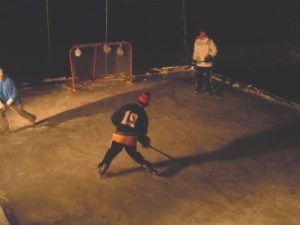 Lighting – if you can point some spotlights from your house to the ice surface, you’ll have extended hours of fun! Buy a ~$30 battery-powered floating water pump for the end of season draining challenge – you’ll thank me. If you only take one end of the boards down in the spring, you can still mow your lawn AND save hours of work! Plus you can keep the goal up for summertime practice on a mat that might also save your garage door from round, black dents. When you get to the point where the kids go to college (unless you’ve developed your own backyard game and parents’ league), give away your gathered items. You’ll be amazed how much spare time you’ll get back in the winter! But it will be sadly quiet on those sunny, 15 degree days in January when you SHOULD be providing cookies and cocoa to a hungry crew. Savor those memories, they are worth the effort. 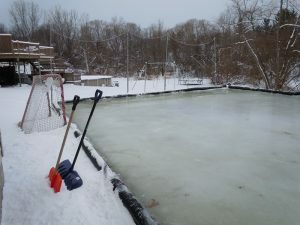 We know there’s a lot of fellow upstate NYers who are skilled at building the backyard ice rink! Please share your tips and advice. We’d love to hear them. This delicious Escarole and Pastina soup includes many Italian flavors that remind me of my childhood. What little Ragazzo or Ragazzi didn’t grow up feasting on ingredients such as escarole, tiny pastina, and cannellini beans? Alisa Fanara, my co-worker (and fellow Italian), shared this recipe. This soup is perfect for a wintery day. Add chicken or sausage to make the soup heartier. Heat oil in a large pot. Add onion, carrot and garlic, salt and pepper. Cook on medium-low heat until the onion is tender, about 8 minutes. Turn the heat to medium-high. Add the escarole and cook, stirring for a few minutes until the escarole is wilted. Add the broth, beans, and tomatoes. Simmer over high heat. Reduce the heat to medium-low. Simmer until the escarole is tender, about 20 minutes. Add the spinach and stir for a minute or two minutes until the spinach is wilted. Cook the pastina separately. Scoop pastina into the bowls. Ladle the soup on top of the pastina. Sprinkle with cheese. Serve the soup hot! The recipe was adapted from the Los Angeles Times.